Throughout this post, I am going to use Raj from The Big Bang Theory to illustrate my thoughts. Just because he articulates them so beautifully. Last year I fell out of love with running. I’m not sure what the trigger was. It might have been the lack of consistent training due to my injuries and Alan being unwell at periods throughout the year. But more likely I think it’s the pressure I put on myself. Why am I not as fast as last year? Why am I not getting any PBs? Why can’t I keep up with her? WHY IS THIS IS SO HARD? Good grief, how boring right? Imagine being in my head for all of 2016. It was exhausting and generally hideous and it made my hobby almost unbearable. I kept comparing myself to how I had run in 2015 and to other runners, and I kept telling myself I wasn’t doing well enough. But compared to WHAT? It was all so utterly meaningless. My pre-race anxiety nearly obliterated my ability to run, especially during the Kevin Henry 5k series – I cried at at least two of them. I mean for goodness’ sake this was meant to be FUN. When did I turn into this stressed out athlete? When did running become something I had started to dread? But a few weeks ago, something happened. I decided to stop caring so much. My mantra is now – cover your ears if you’re not a fan of the swears (forgive me, I’m half Irish) is “F*CK IT”. I think this partly came about because I recently updated the “races” section of my blog, and when I saw how many races I actually ran last year, I was in shock. I had no idea I’d done so many. I think because the vast majority of them weren’t the kind of races that come with goodie bags and selfie-worthy bling I hadn’t actually “counted” them. But I really should have done. Because they were each in their own way a big deal. I even won two trophies last year for crying out loud. So, I’ve decided to stop caring about times and what everyone else is doing, and to fall in love with running again. 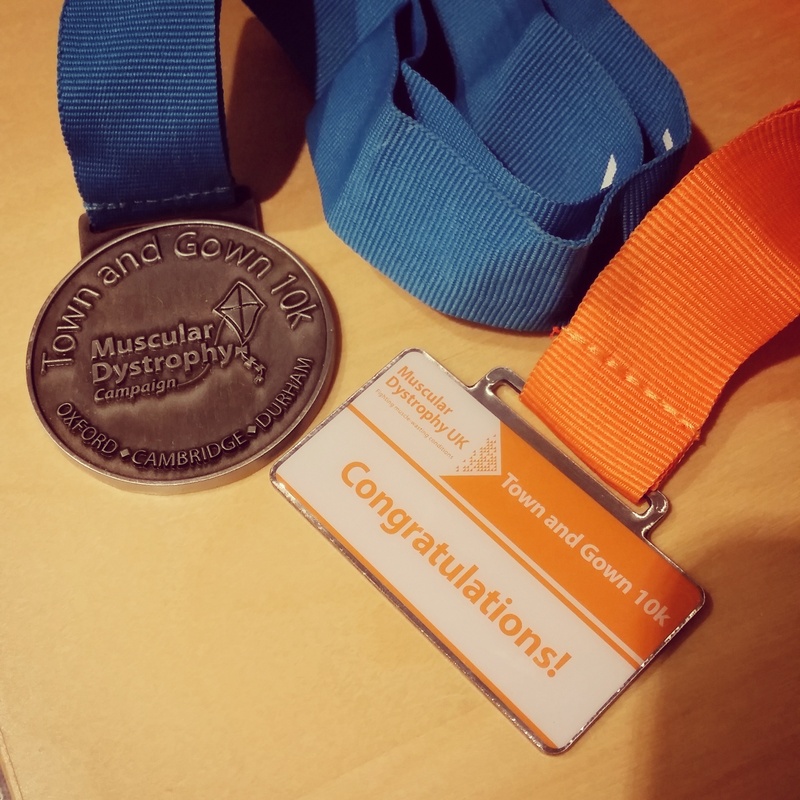 For the first time ever I’m more excited than nervous about the Cambridge Half Marathon (if you’re a long time reader of this blog you’ll remember the terrible head space I was in last year). I’ve even arranged to meet up post-run with Joanna and Pip, two awesome Twitter peeps who I’ve wanted to meet IRL for AGES. I’ll be the one with the pink hair girls. From now on, if a race goes well, great. If it doesn’t, there’s always another. Above all else I want to finish every run having enjoyed it. I know that with social media it can be so easy to fall into the comparison trap, but everyone who is out there running is an awesome runner, regardless of how often they run, the distance they cover or the pace they run at. I include myself in that. Thank you Raj. All GIFs from Giphy. Sometimes, things don’t always go to plan. Take the NYE 10k. I had a miserable time of it, and it really threw me. It was mentally and physically difficult, and I felt weak and my confidence around future long races took a serious hit, leading me to doubt whether or not I even wanted to run long distance anymore. It felt like the joy of it had completely gone. 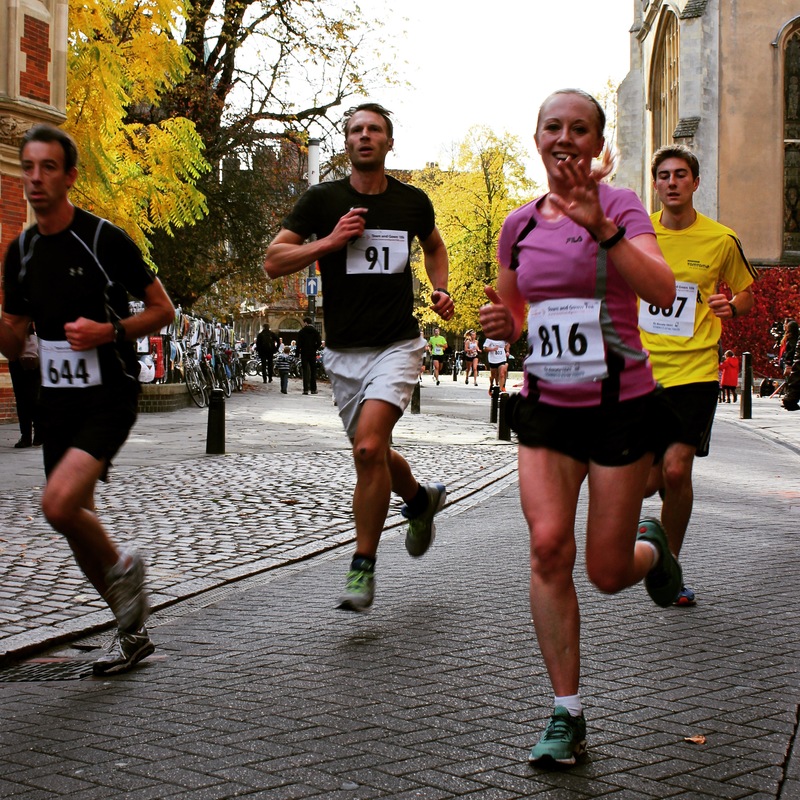 This Sunday (the 28th February), it’s the Cambridge Half Marathon. As training, I’ve done one 7 mile run, two 8 mile runs and two 11 mile runs. These training sessions have been spread out and sporadic, not helped by the three weeks of training I missed due to the awful cold-afflicted time I had of it at the end of January. Most of these runs have been tougher than I’m used to, because at the moment I’m probably only at around 65% of my peak fitness. This also means that I’ve picked up niggles along the way, including a “grumpy” knee and a pulled groin as recently as last week. All of this piles up so that I stress out and run in a tense, stiff posture, making myself more likely to get hurt. It’s a vicious cycle. In addition to this, I’ve been struggling with my hydration due to medication, and this weekend have also developed an allergic reaction to something that has covered parts of my body – including my feet – in a sore, uncomfortable rash. Awesome (and attractive). So I admit that I’ve been tempted to bail on the Half on numerous occasions. At times it felt like the universe was telling me to. I knew a PB would be hard to come by, and I was worried about doing myself more damage on a long run that I was unprepared for. But then something awful happened that made me snap out of my funk and regain my focus. Marcus would have loved to be running the Cambridge Half again, and here I was whinging that it was hard. Of course it’s bloody hard sometimes. If it wasn’t we’d all be nipping off for a 13 mile run before work. So I’ve completely reassessed why I run. I started doing it because like Marcus, I loved it. If I’m not at peak fitness I don’t have to push for a PB. I can just enjoy it. So that’s what I’m going to do. I’m going to run with my friend Rachel, soak up the atmosphere, and run it for Marcus. I’ve sorted my niggles out with some epic osteopathy sessions with miracle-worker Melissa at Spritely Osteopathy and with an intense sports massage from Megan at the FAST Clinic (damn my stubborn glutes!) and I’m trying to get a handle on this rash. But if I have to slather my feet in Vaseline or even crawl this run, I’m going to do it. Unless anyone’s up for giving me a piggyback? An awesome Twitterer has also set up an account in Marcus’ memory, @runformarcus1. The aim is to raise as much money for Marcus’ family’s chosen charities as possible, and in return you get a wristband with #runformarcus on it that you can wear on all your runs so that a part of him is always with you, cheering you on. If you’d like to donate £5 (to cover the cost of the band plus ensure a decent bit for the charities) or more you can do so here. Please also have a read of his blog if you can. It’s a joy to read and his bravery in the face of his illness is awe-inspiring. I’m going to #RunForMarcus on Sunday. I really hope you’ll join me. 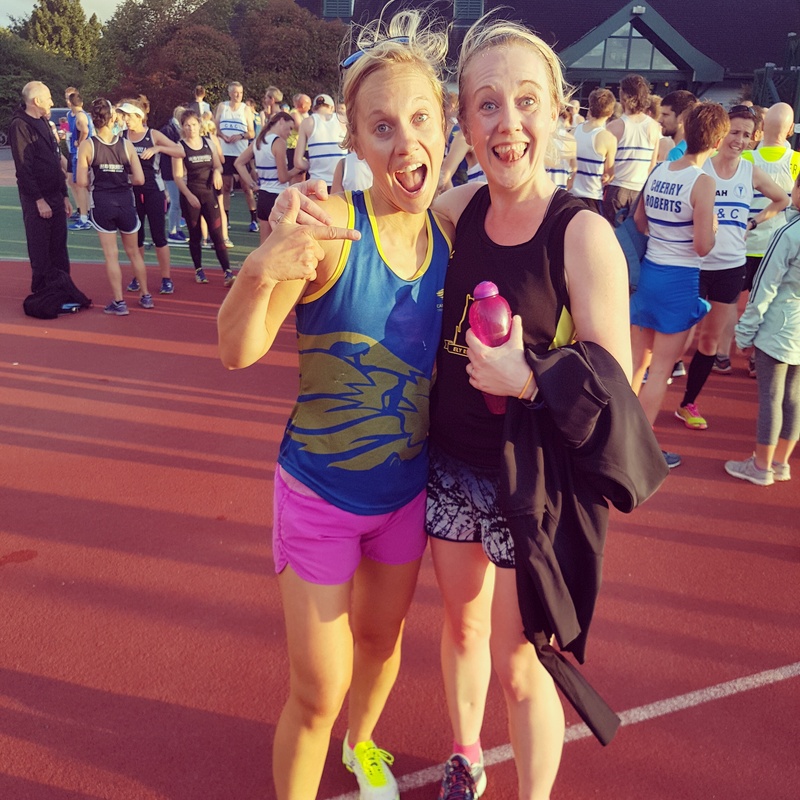 First of all, apologies that it’s taken me so long to write about the evening I spent with marathon runner and Olympian Mara Yamauchi at Anglia Ruskin University – I blame the death cold from hell that has taken over my life and left me mostly sofa bound for a good few days. Never a happy situation for an athlete who likes to be on the move. So, on the 18th January I – along with a handful of Ely Runners – went to a free talk organised by the Greater Cambridge Athletics Network (GCAN). For those of you who don’t know her (and there are a depressingly large number of those who don’t, given her achievements), Mara Yamauchi is the second-fastest British woman to run a marathon (I don’t think I need to tell you who the fastest is) in a time of 2:23:12. She also came in 6th at the 2008 Beijing Olympics and 2nd in the 2009 London Marathon. That’s a snapshot of a pretty impressive running resume. As I settled into a jam-packed lecture hall, the first thing I noticed about Mara was how petite she is – powerhouses can come in deceptively small packages sometimes. The second thing was just how she clearly lived and breathed running. On her own website she says “My life’s passion is running. From a very early age, growing up in Nairobi, Kenya, I loved doing sports and being outdoors. At age 11, inspired by the 1984 Los Angeles Olympics, I decided that I was going to be an Olympian.” Her passion for her sport filled the room extremely quickly, and she quickly made her audience warm to her by threatening latecomers with 50 push ups! You need to steadily increase your training. If you increase the FIT – frequency, intensity and time (length) of your runs all at once you’re more likely to get injured. Your runs should consist of three key sessions – a long run, a threshold run and long intervals (more than 4 minutes). Hill training is great for strength bio-mechanics – increasing the amount of blood per beat of your heart. But she did admit that hill training is tricky around here – she favours San Moritz! Strength training is an important part of any runner’s training schedule. It’s essential for injury prevention and ensuring you hold your form over long distances. The priority with this is glutes – think the clam and leg raises (some helpful images can be found here). The pulling back motion of the arm is extremely important and will help make your running more efficient – work on it. Always try and refuel within 20 minutes of training. A protein milkshake is ideal. An elliptical is good for cross training. If you’re planning to run a marathon, you should aim for a 2o mile run 4 weeks before. Races are excellent as part of a training schedule (i.e. a 10k if you’re training for a half. Before a race, check the course and consider your logistics i.e. how you’re getting there. This gives you less to worry about on race day. Nerves are a natural part of racing, and the adrenaline is useful so try and work with it. These are just some of the tips I noted down in my slightly befuddled cold-y state, but hopefully you’ll find one or two of them useful. Mara also recommended a couple of books – Anatomy for Runners and Strength and Conditioning for Endurance Running – well worth a look if you’re a bookish type like me! Also, if you get the chance, read up a bit more about Mara. She’s an inspirational lady who simply loves to run, but also isn’t afraid to speak her mind, especially on the recent scandals rocking athletics. So as you can imagine it was with some trepidation last Wednesday that I found myself heading back to Wandlebury with Alan and Stacy for the dreaded bench to bench session, aka the scene of my epic meltdown from a couple of months back. The weather was grey and the wind (the FLIPPING wind) had decided to hit its gusty peak at, ooh around 1pm, bang on time for our session. As we walked to the misery zone I did question the sanity of going to a large wood during some of the worst weather of the year that had FELLED TREES. Beautiful Wandlebury photos courtesy of my talented friend theemiddlesis. I tried to take photos while I was there but the grey skies made it look miserable. I needn’t have worried about the weather. The trees buffered us from the worst of it and what little did filter through was thankfully behind us. But I was nervous about my ability to complete the session, especially alongside a seasoned Wandlebury pro like Stacy. I nervously pointed out to her where I had sat in the mud and cried last time, and then just tried to focus on the logistics of what I had to do. Just 9 reps of around 200m up a rough, erratic incline. In total around 7 minutes of running. Easy peasy. Of course it wasn’t easy. But I did it. Even better I managed to stay about the same distance behind Stacy – who is a ninja when it comes to consistent pacing – on every rep. I even went up on my toes on the slightly steeper sections, something that Alan is trying to encourage me to do thanks to some advice from up on high (!). I felt elated afterwards, and not even the utter DRENCHING I got on the cycle ride back to work could dampen (geddit?!) my spirits. This all set me in good stead ready for the Festive 5k in Ely this Sunday. By some fluke I was the winning woman last year, but I think the miserable weather put some strong runners off. This year I knew I could run it faster, but I had doubts that I would be able to hold on to the title. And it turns out the doubts were well founded. As soon as I saw Ruth Jones on the start line I knew she would storm it. She just had that look about her, and when she shot off at the start part of me felt a bit relieved. As lovely as it would have been to win again, it took some of the pressure off and allowed me to just enjoy the run. My aim was to try and stay with my speedy friend Pete for as long as possible. He has a 5k PB of 19:40, so keeping him in my sights would mean a good time. He and I ended up in a cluster of 4 with two other female runners with Pete leading and me bringing up the rear. While I managed to catch up and lead all 4 of us down Lisle Lane to the 3k mark I knew I couldn’t sustain it and decided to let them get past me again and settle for keeping them all in my sights. They give you Santa hats, much needed in the cold weather! The hill through Cherry Hill Park was a killer (Pete and I still can’t decide whether a hill is better at the beginning or the end of a race) and it took everything I had to make it to that finish, 4 seconds behind the 3rd place female and 9 seconds behind the 2nd. I came 10th overall out of 372 runners with a time of 20:37. I gave it absolutely everything I had, and finishing 15 seconds behind Pete is quite frankly insane for me. If he was 42 seconds off his PB, that means in the right conditions I could potentially just dip below the 20 minute mark. Flipping heck. Pete, can you pace me for every race please? Huge thanks to the Arthur Rank Hospice for arranging a fun and challenging race, which I know isn’t easy in a busy little city like Ely. Thanks also to all the drivers who stopped for us! I was still a bit disappointed with my female placing on the day, but as Alan and my “always-been-wise-beyond-her-years” friend Lydia said, if I’ve given it everything, I can’t be disappointed. That was literally the best I could do, and I can’t ask for anything more than that. Plus there’s always next year. Who knows how physically and mentally fit I could be by then? Recently I’ve really been enjoying running 5ks. I think this is down to a mixture of knowing that I can beast myself but that it’ll all be over in around 21 minutes, and also the fact that I’ve been collecting PB after PB over this distance. That’s always good for a positive mindset. But I know Alan wants me to do longer distances (secretly I think he wants me to do a marathon but I’m avoiding having that conversation wherever possible), so back on the 22nd June I signed up for Muscular Dystrophy UK‘s Cambridge Town and Gown 10k, which – if I went ahead with it – would make it the third time in a row that I had done this race. Anyone who reads my blog with any regularity will know that my last 10k was a bit of a bust. I had a pretty nasty cold and so it was a stop and start affair that made me wang on about how much I HATED the 10k distance for a good few weeks afterwards. But an awful lot of my recent interval training with Ely Runners has been around the 10k mark, and Pete and I went on a 5.4 mile training run a couple of weeks ago which went really well. This all meant that I was actually feeling ok about the Town and Gown. Don’t get me wrong – the pre-race nerves were still fully present, but for once I didn’t have that anxiety dream about forgetting my race number that I pretty much always get. Plus Pete is always adamant that pre-race nerves are a good thing, and since he’s a speedy blighter I feel obliged to trust him on that one. I think my biggest concern was the fact that I’d be running it on my own, which is funny when I think about how I had always considered myself a lone runner until this year. Now I always have someone like Andy or Rich to run with at Ely Runners, and the last couple of big races I’ve done I’ve run with Elaine at her pace. I can’t keep up with Pete over such a long distance, so I knew I’d have to dig deep to push myself through this one on my own. After some pretty shocking weather on Saturday, we were lucky to wake up to a cold but dry and bright Sunday morning, with the car thermometer putting the outside temperature at a brisk 5 degrees (making me doubt my choice of shorts over leggings). Ian and I picked up Pete and his wife Rach and the four of us headed into Cambridge to make sure Pete was there to pick up his race number before the registration cut off of 9:30am ready for the start of the race at 10am. While Pete and Rach headed to Midsummer Common I got to hang out with my sister, her partner Simon and my nephew Danny and niece Eloise for 40 minutes or so. The bonus of having a sister who lives near to the start of so many of the big races in Cambridge (and the provision of a non-Portaloo pit stop!) cannot be underestimated. At about 9:20 I jogged to the start and caught up with Pete and Rach and after jogging around a bit more I finally plucked up the courage to give Rach my nice, warm Sweaty Betty top, before heading to the start line to begin the race with Pete. 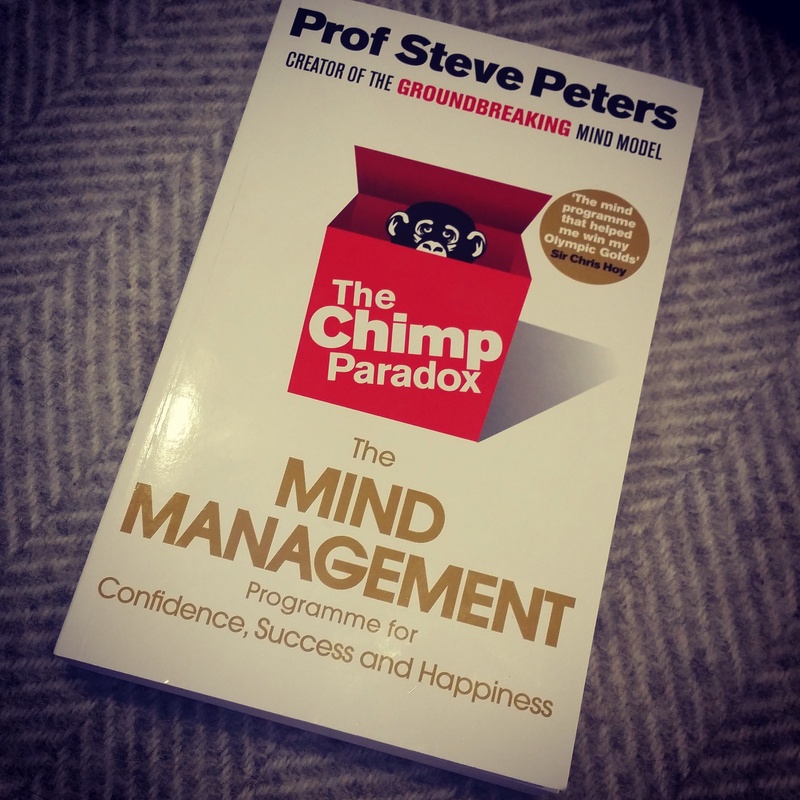 I had absolutely zero intention of staying with Pete for anything longer than about 60 seconds, but by some miracle I stayed with him until around the 2k mark. We had blasted out the first mile in something ridiculous like 6:20, and when he peeled away by about 10 metres as we turned off Queen’s Road onto Silver Street I decided not to try and keep up with him. I know my limits pretty well, and I think if I’d tried to carry on matching him completing the 10k would have been difficult. But thanks to him I had gotten off to a cracking start. Waving to Andrew at around the 3k mark. I had already checked where the water stations were on the route, so I hadn’t taken my water bottle with me on the first 5k. But when I saw that they were handing out cups rather than small bottles or pouches I made the decision to grab my running bottle (I got a telling off for that later) from where I’d tucked it out of sight on the route. The thing is, sometimes I can’t drink a cup of tea on the sofa without choking on it, so trying to gulp from a cup of water mid run was not going to end well. The second part of the 10k took us away from the city and out along the river, which is a lot quieter in terms of support but it’s flat and fast. The main issue is that it doubles back on itself, so the super fast runners come past you on their last 2k or so while you’re still fighting at the 6-7k mark. However, it was at this point that I saw Liz Fraser, a previous winner of the race, and I worked out that she could only have been a couple of minutes ahead of me. Naturally I assumed this meant that she was just having a bad race as opposed to my having a good one. Unfortunately I started to get a stitch just before 8k, but luckily I got a handle on it fairly quickly, forcing my breathing to become more regular as it had become a bit erratic as I started to get tired. The final kilometre and a half was nothing short of agonising, but I kept trying to tell myself that it was only 4 more times around the track, just three more times around the track, chipping away the metres in my mind and telling myself “you got this, you got this.” When Alan appeared near the end and said to me “Come on, sprint finish! Kick! KICK”! I gave those last couple of hundred metres EVERYTHING I had. I can’t even begin to explain how agonising it was to find out that the big flags I had seen didn’t actually mark the finish line and that I actually had another 20+ metres to stagger to the end. After tweeting the organisers about this they explained it was a mix up with Sussex Sports Photography – the flags were theirs but as a runner in the final throes of a 10k you assume that any flags in the final few metres are the finish line. After having a great chat with Annie from MDUK on the phone earlier (how awesome that she took the time to do that?) she told me they’d make sure that any flags by any of their supporters wouldn’t be put in that position again. So as you can see my improvement over the last couple of years has been a bit nuts, and this is in no small part thanks to Alan. But back to that rollocking he gave me. His words after I finished were “Well done, but if I ever see you running with a water bottle again…..” My reasons for doing so fell on deaf ears but this is something we need to work towards together. This is only the 2nd 10k I’ve run since he started coaching me, and I planned to run without it until I saw the water station. I need to build towards this, and I am someone who sweats a lot so I need to be able to take on some fluid on longer races. He said we’d chat about it when we next train, but since that’s going to be at Wandlebury – and we all know what happened last time I was there – perhaps we’d be better off leaving that chat until next week. Regarding the actual race itself, I think it’s an utterly brilliant 10k and would recommend it to everyone. It’s without doubt my favourite 10k in my racing calendar (sorry NYE 10k – those exposed fens are just evil). It’s a serious PB course especially when the conditions are as perfect as they were yesterday – everyone I know who ran it got a PB – and the support in the city is brilliant. It’s really scenic too, and almost completely flat (although the little incline at about 8.5k is a sod). I would say they could do with more toilets as they don’t seemed to have increased the number despite having around 500 more participants this year, and the medals were a real step down from previous years (I personally don’t mind too much when it’s a brilliant race for charity, but I think it’s worth mentioning). And as for that Cool Dawn Recovery drink that came in the goodie bag – revolting doesn’t cover it. If you enjoyed reading this blog, please send a pound or two to the brilliant charity who turned Cambridge orange for a day. You can do so here. It may come as a surprise to you that sometimes I doubt my abilities as a runner. I know right? I best give you a moment to get over the shock of that particular statement. I’m not even sure what my problem is. Frustration that I didn’t discover running earlier, worries that I’ve not achieved what I feel I should have done in 33 years, general lack of patience and comparing myself to those who are fitter, stronger, younger, more experienced. Probably a combination of all of those things and many many more. But I’ve noticed a change in the last couple of weeks. I think a tiny part of me may be starting to believe that I’m a good runner. Some of you may be rolling your eyes at this and hovering your finger over the mouse to read about people pretending to faint to see if their dogs really care about them. Anyone who has only known me for a couple of years may only know the Duracell bunny, fitness fiend version of me and think I’m just fishing for compliments. But those who know me from years back (and especially my family) will know that I never looked like someone who could do the things I do know. I was a real trier, but few things came naturally to me, especially in the world of sport. I’ve always had to work pretty hard to be good at anything, except maybe for being a bossy loudmouth. That always came pretty easily. But on the 10th September I was set to do the final Kevin Henry League 5k race for Ely Runners. I had only done the Ely sprint tri on Sunday 6th and that had tired me out more than I had expected, because when I run a long distance race I can get into a groove and switch off ever so slightly, but for the triathlon I had to stay more tuned in and consider the various disciplines and transitions, so my mind and body had been worked HARD. So when I left work at 6:20pm on Thursday to head half a mile down the road to the athletics track where Cambridge and Coleridge were hosting the run, I felt shattered with my stomach in knots and my hands shaking. My pre-race nerves are pretty epic, but I had one thing in mind – keep my training partner Mary in sight. Alan had given me a talking to (read: slight bollocking) that morning. He told me to stay with Mary, and I told him I couldn’t. Big mistake. Alan doesn’t understand the “can’ts” and “couldn’ts” of the world. But I know that Mary is faster and stronger than me over longer distances and I thought he wanted me to stay literally on her shoulder. But he explained that he just wanted me to keep her within my sights, and I told him I’d try, which is all he ever really wants from me. It was a gorgeous evening for a run – the temperature had dipped to about 16 degrees, and there was just a slight breeze. At the start I was gabbling to anyone who would listen, threatening to demand piggy backs from strangers and to run in the opposite direction, but then Mary made me laugh (slightly manically) about my nerves, calling them my “nervous owl” (thanks to a previous post) and I settled into the start in the same sort of place as her. It was time to see if my nervous owl could become a bit more confident. I then went on to run the race of my life and I’m still not entirely sure how I did it. Somehow I managed to not only keep Mary in my sights but to actually stay on her shoulder the whole way round. I kept thinking to myself “it’s ok if she gets away at 2k, it’s ok if she gets away at 3k, oh my giddy aunt I’m still with her at 4k and flipping heck am I really at the final 300m and still only one place behind her?” I had pushed myself so hard that I didn’t have enough left in the tank at the end to catch her at the line, but when I heard thundering footsteps and heavy breathing at my shoulder I knew I had not run that kind of race only to be overtaken by someone at the line, so I dug deep and managed to finish one place behind Mary. It took 5 days for the official times to come through. FIVE. DAYS. I am one of the least patient people I know so I cannot tell you how agonising it was waiting to see my time. I knew I had a PB, but I had no idea how much time I had taken off. I NEVER expected it to be 55 seconds. And it turns out that I had managed to keep not one but two other C&C runners at bay in that final sprint. 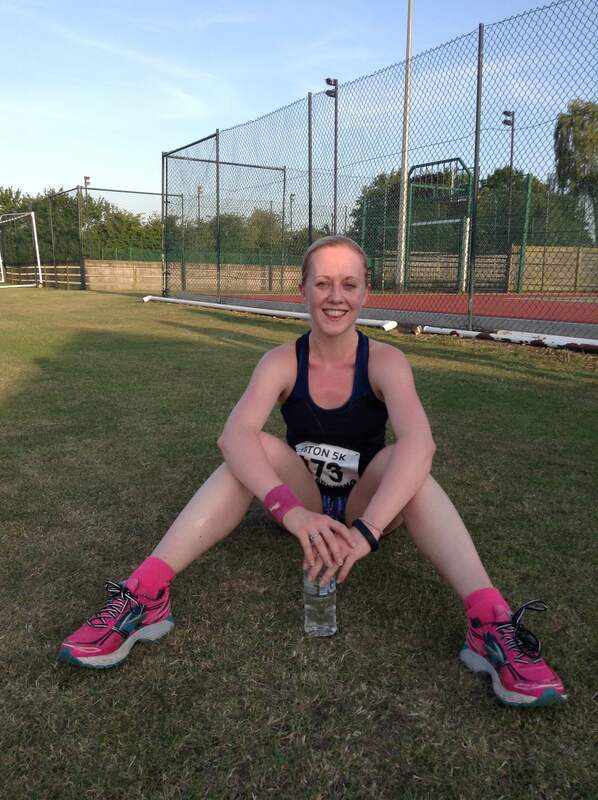 I think during the run, I found myself wanting to push for Ely Runners who have been so welcoming and do so much to create opportunities for people to enjoy running and even to excel at it. I wanted to do them, Alan, Mary and myself proud. And ultimately there was a feeling of “this is the last race of the league. I may as well hammer it.” The resulting PB is somewhat arbitrary compared to my existing one of 21:14 on a rougher, harder course (Milton Parkrun), but that is still I time I never, ever thought I was capable of achieving even on my very best day in perfect conditions on a fast, flat course. So now I find myself in what feels like a quandary. I’m starting to believe that I’m a pretty good runner, but of course this means my head is running even faster than my legs and I’m over thinking things again. How seriously do I want to take this? What if I fully commit and I’m not good enough? What if I fully commit and I am? 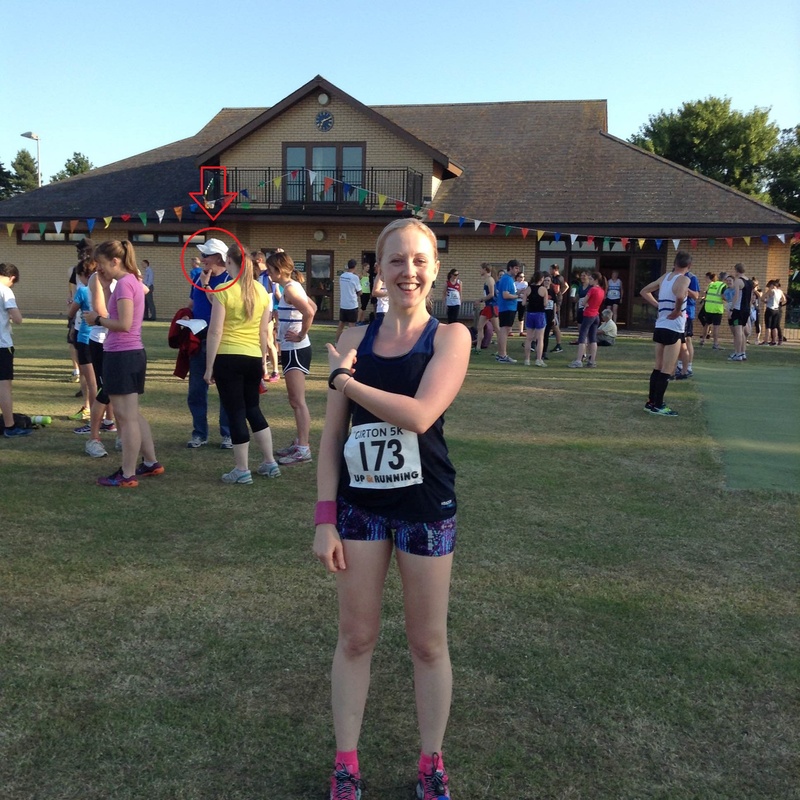 So this has been a week of firsts – my first time training with a partner, and my first time running the Girton 5k. First of all, I’m going to get my excuses out of the way. I’ve just come back from 5 days in Germany for a flipping fantastic wedding, but it was hot. I’m talking seriously hot. As in didn’t get below 35 degrees and was 40 the day we left hot. Add a room on the third floor of a hotel with no air conditioning and you can imagine the sleep quality. So on Wednesday, when Alan rocked up with Mary Twitchett to makes us do 10 x 100m sprints, I was a little nervous. Mary is without doubt one of the fittest women I’ve met in some time. Whilst I was drinking Prosecco in Wiesbaden, she was doing a half ironman. Just one glance at her athlete profile on Power of 10 was enough to make me start fan-girling a bit. Her 5k PB is 20:14, her 10k PB 42:20, and her half marathon PB is 89:03. That’s some serious stuff. Mary’s in the middle. Behind that smile is an endurance level set at STEEL. So we warmed up together and ran the 100m on opposite sides of the path so that Alan could assess our techniques in turn. 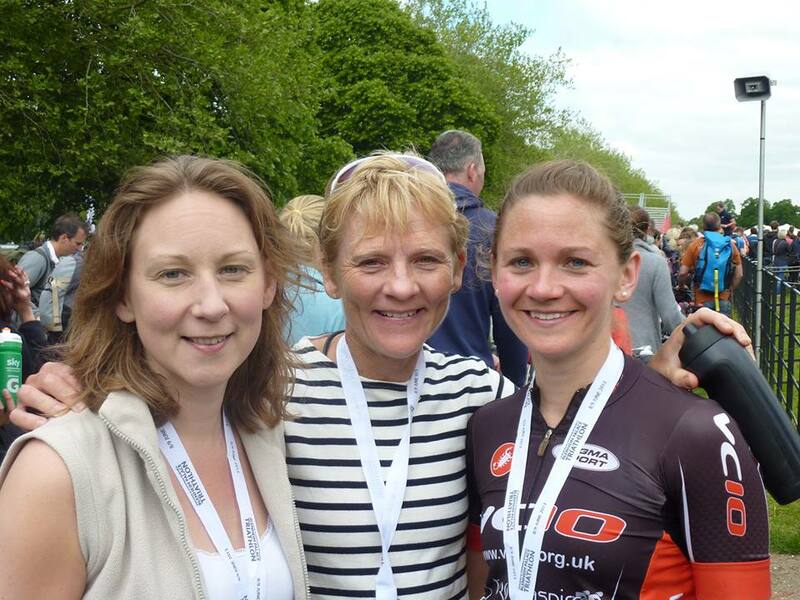 It started off well – I felt pretty strong, finishing maybe a second ahead of Mary and using my arms really well. After the 4th sprint my legs started feeling wobbly. And that’s when I started declining. Yet again my head took control of my body and I kept thinking about how I couldn’t possibly do 6 more, how Mary was now getting ahead of me and how I was letting her and Alan down by getting tired too quickly. Here’s something you should know about Mary – her positive mental attitude is incredible. When she saw me flagging she shouted words of encouragement, trying to push me on. I didn’t really manage to step up to the plate, and after sprint number 8 Alan cut the session short because Mary had to get back to work and because I was quite frankly struggling. My tread had become so heavy you could have heard me pounding down the path from a mile off, let alone 100m. Alan says it takes 5 years to get the mindset of a serious athlete. Hopefully this might make it happen a bit faster. Naturally I’ll let you know how I get on with it in another post later on. Mary and I are going to train together next Friday, which is exciting and nerve-inducing in equal measure. So, the day after sprintageddon, I found myself cycling the three miles from work to Girton for the Girton 5k. This event has been running since around 2009, and I just thought it would make a nice change to try a different race. I was sad that my friend Oli couldn’t make it because of work commitments, but my friend (and photographer for the day!) Andrew was happy to snap up his place. Alan was also meant to be running it, but changed his mind at the last minute. Wise considering he had a 3am start the next day for his holiday! The coach knew at least 75% of the people running. Shocker. Such a socialite. I was a ball of nervous energy before the race. It was around 23 degrees in the sun, and would be the first time I’d run in hot(ter) weather without a bottle of water, plus the sleep deprivation was really kicking in. So I drank lots before the race and annoyed everyone around me with my insane chatter. The race itself ended up being challenging but fun. The terrain was really varied, with tight turns through gates around the fields. One section was pretty rough underfoot due to the dips where horses or similar had been in the mud and it had then dried, which meant that I found myself running a bit gingerly when I probably should have just gone for it. It was also pretty hard to overtake in sections where the path got really narrow. It has to be said though, that in the summer evening light it was one of the prettiest races I’ve done. Alan also managed to turn up twice on the course to cheer me on which was frankly lovely. I had no idea what time I finished in, and sat down to enjoy a chat with some fellow runners in the lovely weather, gifting my free half pint to a grateful finisher who wasn’t willing to let it go to waste! I felt certain that I wouldn’t have achieved a PB, but I hoped I wasn’t too far off. 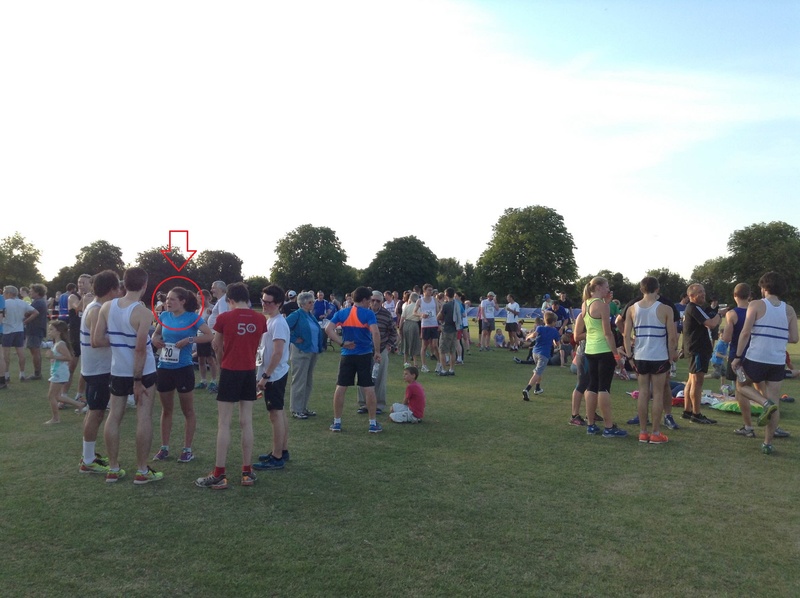 I also spent a lot of time that evening chatting to some members of Ely Runners. When I told her my PB, one girl from the club asked me why I wasn’t part of a club myself and I didn’t really have an answer for her other than worrying about the pressure of running and not being able to meet the expectations of others – in other words, my head was stopping me. Alan then said to me that maybe I should consider it, as he thought I could learn a lot from the Ely Runners I met. Something to think about. The results came through this morning, and I ended up as 5th woman in 22:08. That’s 40 seconds away from my PB and at first I was disappointed, especially as the 4th woman came in at 21:59. However, when I spoke to Andrew (who came in at a STONKING 18:29), he told me that it wasn’t a PB course, and that he was 35 seconds off his PB. That made me feel a bit better, but did make me think that I could benefit from some more trail running practice. So overall it’s been a serious week of running experiences that I can learn from. And after some rest this weekend, I’m looking forward to seeing what happens next week. And can we please take a moment to appreciate the awesome girl highlighted in this photo, George Schwiening, who finished as first woman in 17:31. Woah. Ok, so last week’s blog post was a little bit “woe is me, this running malarkey is so hard!” First world problems right? But sometimes it is cathartic to get your thoughts out there and have people empathise with you and discuss how track running is a much greater mental challenge than trail or road running. I’m glad it’s not just me. Getting your pacing right over different distances takes practice and patience. Those who know me well know the latter is a really strong point of mine. Ahem. For a little while I thought I might be facing the 4 x 1 mile session myself, but after doing my warm up a voice boomed across the track and there was Alan on his delivery bike (he’s working for the University Exams Syndicate at the moment). Although I was preparing to take on the session alone (I know he can’t always control his working schedule), I know that I’m not going to be as tough on myself as Alan will be so I was pretty pleased to see him. It was going to be a challenge – only a minute rest between the first two miles, followed by a 6 minute “rest” (Alan’s rests aren’t exactly known for being relaxing) where I’d do 9 goblet squats with a 20KG KETTLEBELL and then the next two miles with only a 30 second rest in between. Can I just take a moment to mention that I’m 53kg? Ok, carry on. As per usual I went off too fast, completing the first mile in 6:36. Not a mile PB, but I wanted to do each one anywhere from 6:30 – 7:00 minutes, while Alan was just after sub 7:00 for each one. At least we were on the same page. The second one came out as 6:43, and then after 6 minutes and the evil squats, I was back out there. I then did a 6:46, and finished on a 6:54, which I was a bit disappointed with, but I slightly blame the fly that decided to take a swim in my eye, and the wind had started to take its toll a little. The most important thing of this session is the fact that I enjoyed it. Not the physical process which was tough and demanding, but the fact that I took control of the situation, kept my head up and used my arms better than I have done before. Alan said “you’re not doing much wrong Lauren.” RESULT.